American journalist; born in Cincinnati Oct. 20, 1861; brother of Adolph S. Ochs; educated at the University of Tennessee. 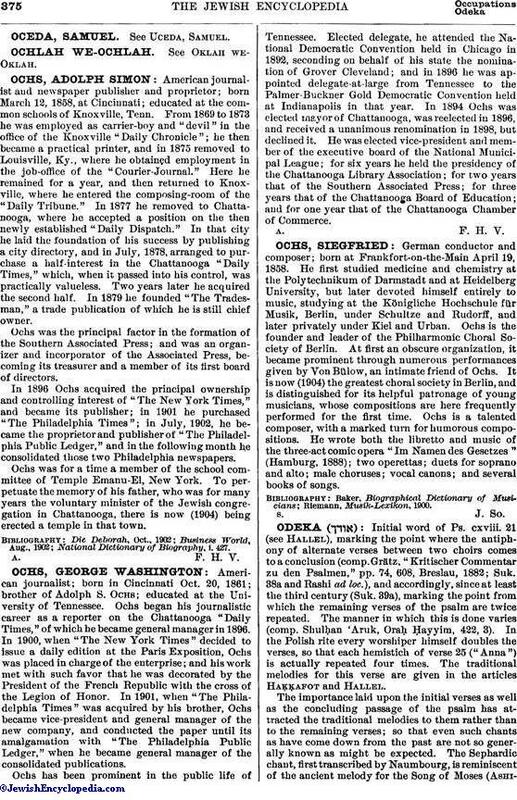 Ochs began his journalistic career as a reporter on the Chattanooga "Daily Times," of which he became general manager in 1896. In 1900, when "The New York Times" decided to issue a daily edition at the Paris Exposition, Ochs was placed in charge of the enterprise; and his work met with such favor that he was decorated by the President of the French Republic with the cross of the Legion of Honor. In 1901, when "The Philadelphia Times" was acquired by his brother, Ochs became vice-president and general manager of the new company, and conducted the paper until its amalgamation with "The Philadelphia Public Ledger," when he became general manager of the consolidated publications. Ochs has been prominent in the public life of Tennessee. Elected delegate, he attended the National Democratic Convention held in Chicago in 1892, seconding on behalf of his state the nomination of Grover Cleveland; and in 1896 he was appointed delegate-at-large from Tennessee to the Palmer-Buckner Gold Democratic Convention held at Indianapolis in that year. In 1894 Ochs was elected mayor of Chattanooga, was reelected in 1896, and received a unanimous renomination in 1898, but declined it. He was elected vice-president and member of the executive board of the National Municipal League; for six years he held the presidency of the Chattanooga Library Association; for two years that of the Southern Associated Press; for three years that of the Chattanooga Board of Education; and for one year that of the Chattanooga Chamber of Commerce.